The two four-voice choirs are placed separately, allowing the listener to experience the complexity of the choir parts with more transparency making the unique stereophony of this work more concrete. n the summer months of 1748 Handel composed the two oratorios Solomon and Susanna for the ensuing season. He started on Solomon on 5th May 1748 and terminated the score on 13th June 1748 with the devotion S.(Soli) D.(Deo) G.(Gloria). The work is considered a link to Handel's later oratorios. His earlier oratorios are coloured with political affairs and allusions, as in his famous oratorio Judas Maccabaeus, inspired by the Scottish rebellion of 1745. Solomon depicts a wise and god-fearing ruler, with Solomon's court presenting the image of an ideal society. The central theme of the libretto has its origin in narratives from the Old Testament: the Book of Kings (1st Kings 1-11) and the Chronicles (2nd Chr. 1-9), among others. Despite this, one ascribes this oratorio not only aspects of the Judeo-Christian tradition, but also a pantheistic world view, in which God is to be found in all aspects of life. The different qualities of King Solomon are demonstrated and celebrated in the various acts of the oratorio. It is often suggested that Handel wished to extol the golden age of England and its ruler, George II who had granted him English nationality. 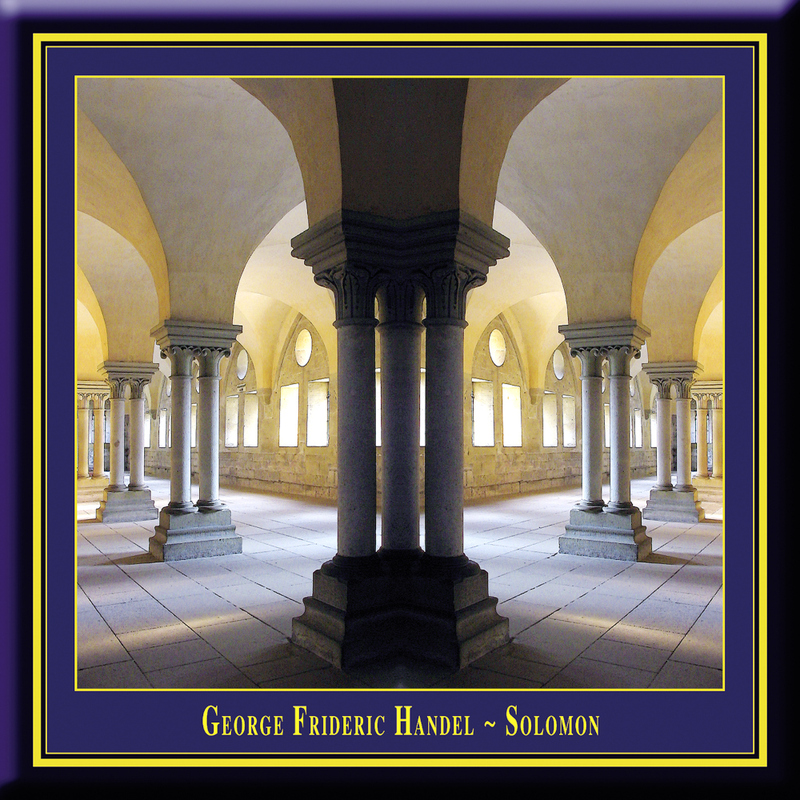 Handel praised the glory of England and its monarchs with this oratorio by equating them with Israel and King Solomon. He used a, for that time, very large orchestra and was able to use the unparalleled expressive possibilities in his depiction of "pomp and circumstance". The oratorio is not distinguished with a dramatic plot, but rather contains juxtaposed pictures and scenes. The ensuing static impression that emerges is balanced by the richness of colour in the individual tableaus. The different scenes and events allow Handel to use his whole palette of compositoric expression. Differentiated instrumentation, large choral pieces, soloistic elements and sensitive musical character studies demonstrate Handels great artistic ability. With two choirs and seven eight-voice choir parts he exhausts all at that time existing composition possibilities. By casting Solomon with a countertenor he uses opera's tradition of elevating heroes abounding with nearly supernatural strength and wisdom into the superhuman by using feminine voices. In the first act, Solomon appears as a God-fearing King, celebrating the finishing of the temple in Jerusalem with his people, following which we see the love to his wife, his generosity, his gentleness and fidelity. Powerful, jubilant choirs bear witness to the court's splendour and glory. The passage in the text "till distant nations catch the song" from the choirs' With pious heart is composed very vividly by Handel. The numerous fugal entries mirror the different nations that spread God's message. The act ends with the royal couple's retreat into the bedchamber accompanied by a soft background choir. Nightingales (flutes) and warm breezes (deep rustling of the violins and violas) enhance the twilight atmosphere. In the second act, the famous story of Solomon's wise judgment is told. A servant brings the petition of two dissenting women who are seeking the King's judgment. It is revealed that both women have given birth to a son. It is asserted that one of the sons died in the night and the mother swapped her dead son with the other woman's child. Both now claim to be the true mother and denote the other a liar. In this difficult situation, Solomon uses a clever ruse. He proclaims the child should be cut in two and each woman should be given one half. While one of the women consents, the other woman desperately asks him to spare her innocent child. She would rather let the other woman have him than to see him die. Thus Solomon recognizes in her sorrow and despair the true love of a mother and returns the child to her. The musical high points in this act are primarily the portrayals of the main figures, with distinctive motifs being assigned to each individual. Hard, syncopated rhythms characterize the envy, the inner turbulence and the wickedness of the childless woman, whereas the other woman, seeing her child in great danger, is accompanied by dotted figures in the bass line, which form the basic atmosphere of gnawing fear. Dissonant suspensions and modulations increase this fearful tension, until the difficult decision "take him all" leads to a resolution in major with a simultaneous, descending, mournful bass line. The characters join Solomon to form a musically masterful trio. Handel is able to elaborate and illuminate their characteristics in an unparalleled way. With the arrival of the Queen of Sheba, the final act of the oratorio demonstrates Solomon's "foreign policy" ability. Choir pieces expressing the most diverse human emotions are performed for her entertainment, allowing Handel to demonstrate his full range of composing skills. Possibly Handel deliberately wished to incorporate the four tempers in these chorals for the Queen of Sheba: sanguine Music, spread thy voice around, choleric Shake the dome, melancholic Draw the tear from hopeless love and phlegmatic Thus rolling surges rise... and all is calm again. In the choral Shake the dome, the two choirs confront each other like two armies in battle and are further roused by the extreme dotted rhythms of the strings. The audience experiences the choirs from the standpoint of the Queen of Sheba and is thus drawn into the happenings in a way analogous to the Greek dramas. The Queen of Sheba shows herself to be impressed with the choirs' tonal versatility and Solomon's court. The following choral, Praise the Lord with harp and tongue, exalting not only God but also and above all Solomon, is one of Handel's most magnificent works for two choirs and is thus sometimes used as the final chorale. Here, however, there follows the farewells of the two rulers and the oratorio finishes with the moral essence, "The name of the wicked shall quickly be past; but the fame of the just shall eternally last".